13 dubbing artists who have been the voice of popular characters like Kattappa from Baahubali, cartoon character Doraemon etc met with Hrithik Roshan in his house on Friday afternoon. The one thing they all unanimously told him when he walked in the room was that they were extremely proud that an actor like him played the role of a dubbing artist in his last movie, Kaabil. It is perhaps for the first time in mainstream cinema that someone played a dubbing artist on the silver screen and the actual hero of the film was the voice. Hrithik very inquisitively asked the dubbing artists multiple questions relating to their profession to know more about it. The dubbing artists, on the other hand, were really amazed at the in-depth study that Hrithik underwent for his role. They expressed how the session was a learning experience for them too. Everyone of them had their own moments with Hrithik Roshan but one thing was common in all of them. They all felt a sense of pride in the way Hrithik played a voice dubbing artist and used his skills in a manner that made this profession the hero of the film. Hrithik also made them listen to his practice recordings. They wowed and clapped at his range, voice texture and moreover the amount of effort he had put into this. One thing they all related to was the scene when his character is emotionally low and wants to cry but has to do a laughing dub. Hrithik understood that. One of the dubbing artists even mimicked Hrithik’s character from Koii Mil Gaya which Hrithik absolutely loved. 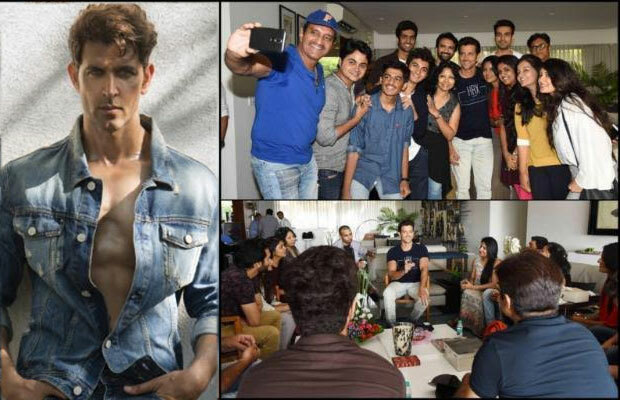 By the end of it, all the dubbing artists were extremely overwhelmed that Hrithik spent 40 – 45 mins with them, interacting and clicking pictures. Previous articleAll’s Not Well Between Malaika Arora Khan And Sohail Khan’s Wife Seema Khan? Next articleAvika Gor: Manish is Just A Few Years Younger Than My Father!